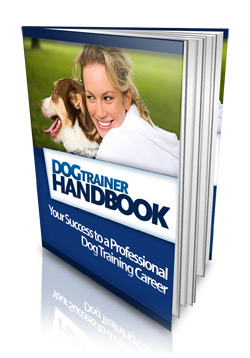 So you want to become a dog trainer? As there are no set requirements or formal qualifications to become a dog trainer, you do not need a degree or formal training course. This however does not mean that anyone setting themselves up as a dog trainer and offering their services will succeed, you will have to have some credibility and be able to show results for people to trust you with their dog and part with their money. If you heard that Joe down the road has fixed lots of cars and is good at what he does then Joe gets the job. Mr fix it on the other hand may not be as good as his advert.The one that is most often chosen is the one who comes with the best recommendations, not always the one with the certificates. So it would be possible for anyone to start a business in dog training, providing they have a good reputation and come with excellent recommendations.To grow a successful business, one that will attract customers, it is recommended to establish a credentialing program, which enhances the reputation of a profession. A certification program is not an endorsement of an individual by the organization, but it signifies to potential customers seeking to use the professional that the professional has sought out a credentialing program and has passed the credential's requirements. Certification is a voluntary program, unlike licensing which is not voluntary for professions such as physicians, nurses, and psychologists. What motivates you to become a dog trainer? First and foremost should be your love and desire to work with dogs, if you first find a job that you enjoy then find someone to pay you for doing it, you have the best of both worlds. A deep understanding of dogs, remember that each dog is an individual, one boxer dog may well show the same characteristics that are “typical” of the breed, but the dog as an individual will show many characteristics that are unique to him, just like humans. A patient, calm approach to working with dogs, being individuals they will respond at varying rates, not every dog will have the same degree of intelligence, ability or desire to be trained, and treat every training session as a game. A patient trainer recognizes that training should only advance at the dog’s pace. Observation of a dog working will identify problems and areas of misunderstanding. This ability comes with working closely with many different dogs and dog breeds . Some dogs are very quick to learn new things, while others take more time to grasp what you are trying to achieve with them. 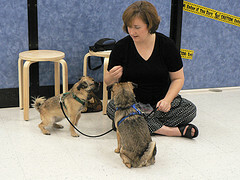 Selecting the type of dog training course to take. You will build the foundation of knowledge that you build your career on. Your dog training course should last several months, it is not possible to learn all you need to know in a few weeks to become a dog trainer. There are a numerous dog training courses available through correspondence schools. These courses are mostly “self taught”. 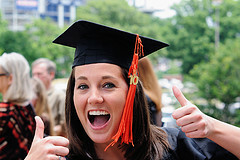 The materials are sent to you which you then study and take tests and assignments within a reasonable amount of time. You will need to take a dedicated approach to studying, This method does give you the freedom to study at your own pace, however if you learn best in a classroom where you can get answers to your questions, consider a classroom dog training course. Some of the benefit of classroom training are having the classes paced, completing your training within a prescribed period of time. Before investing in a training program, inquire about the schools’ training philosophies. If a school makes claims that you will learn all you need to know in a few months then there creditability must be questioned. Ask to be contacted by previous students so that you can make decisions Using the internet is a good way to find reviews on any dog training course you are considering. Most dog trainers are in business for themselves. In addition to your skills as a dog trainer you will need to develop your skills and ability to communicate with people, as the owners are the ones that will contact you and pay your fees.Business building skills, advertising campaigns, tax, accounts these are just a few of the things you must consider. Do not let these obstacles stand in your way as most of them can be delegated to others at a price. The tremendous feeling of satisfaction when you help a dog and owner to live a happy life is well worth the time you have taken to study and hone your skills, which is an ongoing process as you learn something new everyday, which you can use with the next dog and new challenge. Final words of advice, the best people to give you the best insight are those who are actually doing the job, find an talk to professional trainers, those I have met have been more than willing to give information on how to become a dog trainer, if possible try to arrange it so you can observe a training session. While you are studying try to join a rescue shelter where you can gain experience from observing many different dogs and breeds and even practice some of your skills. The experience and knowledge you gain while studying will be useful to you when you become a dog trainer. Many of the best dog trainers are self taught.